Austin Hill drove to a 16th-place finish on Saturday afternoon in the TruNorth Global 250 at Martinsville Speedway. Hill leaves “The Paperclip” seventh in the ultra-tight NASCAR Gander Outdoors Truck Series championship standings, only 16 points out of the lead, and still holds the only guaranteed spot in the playoffs. Hill began the first short-track race of the season from the ninth position and ran inside the top-10 for the vast majority of the first stage. The driver of the No. 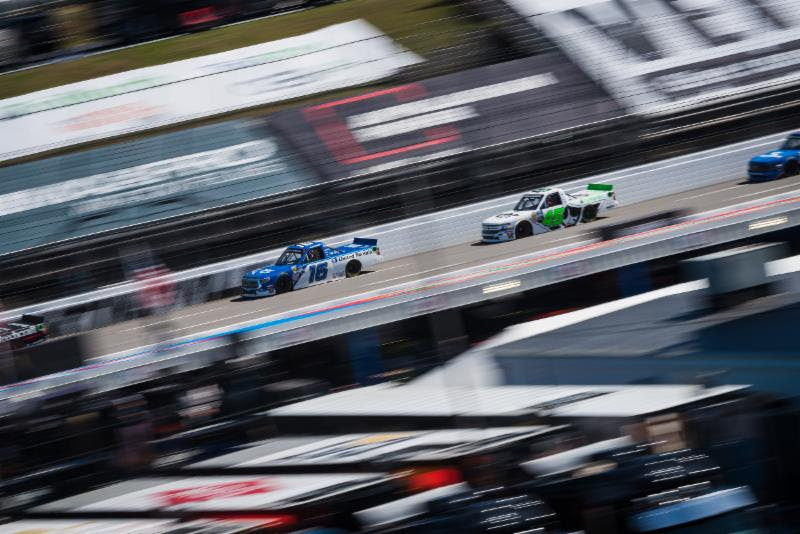 16 United Rentals Toyota Tundra dealt with a lack of forward drive off the flat corners but managed to garner three points in eighth position at the end of Stage 1 on lap 70. Hill stayed on track while the rest of his competitors pitted under the stage break and inherited the race lead for the lap 80 restart. Despite a 50-plus lap disadvantage on tires, Hill hung tough to maintain a net track position gain and ran sixth when a fortuitous caution flew on lap 118. Hill came to the attention of crew chief Scott Zipadelli and company for four tires and air pressure changes to aid his tight condition in the center of each corner. As the majority of the field pitted along with Hill, he maintained his position in the top-10 and earned another three points in eighth at Stage 2’s conclusion on lap 140. Over the final stage, Hill’s balance consistently built tight as rubber continued to lay down on the 0.526-mile oval. Hill consistently contended for a position in the top-10 and came to pit road for four fresh tires for the final time under caution on lap 211. Hill restarted 17th and blitzed his way to 10th in just 11 laps. A caution with seven laps left bunched up the field and led to Hill being on the wrong end of contact with the No. 13 truck with two laps left and relegated him to a 16th-place finish. “We just kept getting tighter and tighter as the day went. A lot of rubber got laid down on the bottom and our United Rentals Tundra just didn’t roll the center like we needed to. Scott (Zipadelli) made a good call towards the end to put tires on it and play offense the last 30 laps or so. We got back up to 10th before that last caution, and it definitely wasn’t what we needed. It’s Martinsville and it gets physical and unfortunately, we were on the wrong end of it today. I'm glad we don't have to wait long to get to Texas next week and try to try get ourselves a little redemption."